UNTIL the arrival of the railways the highest upstream point on the tidal River Mersey, where it could be bridged, was at Warrington; prior to that the location of a ford recorded in Roman times and before. 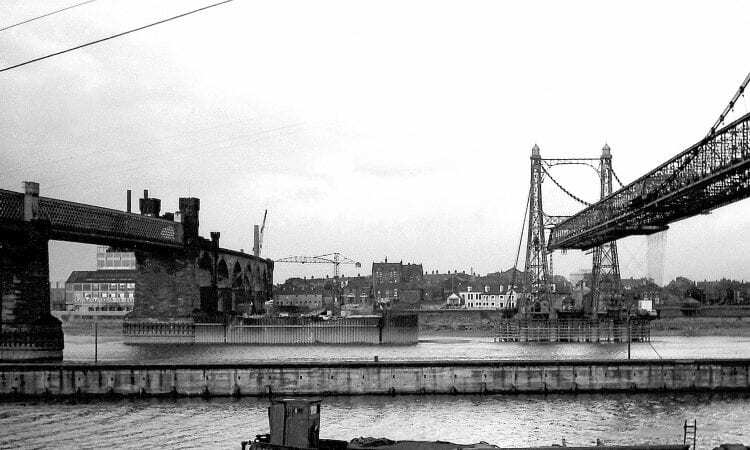 Barges and the ferry at Joseph Crosfield & Sons’ Bank Quay wharves on the River Mersey in 1960 with the original 1905-built Warrington Transporter Bridge in the background. The later bridge is just around the bend. This also accounted for the proliferation of ferries including the famous ones at Liverpool. In 1868 the London & North Western Railway spanned the Mersey with a high-level viaduct where it first narrows between the towns of Runcorn and Widnes; a location known as the Runcorn Gap. It was 75ft above normal water level as the Admiralty demanded this clearance for the masts of sailing vessels. Perhaps fancifully for the engineering of the times, James Brindley had originally proposed carrying his Trent & Mersey Canal line on to Liverpool via an aqueduct across Runcorn Gap. At the end of the 19th century came the idea of transporter bridges – passengers and vehicles moved on a platform suspended from a high level span; the first in the world being opened in 1893 in Bilbao, Spain. This seemed the ideal solution to connect Widnes and Runcorn, especially as the ferry crossing had been complicated by the construction of the Manchester Ship Canal alongside the Mersey. So the Transporter Bridge was built and opened in 1905. It was to survive until 1961 when the parallel fixed Silver Jubilee Bridge was built and it went for scrap. Because of today’s traffic requirements yet another new bridge is currently under construction. Transporter bridges seemed to have become fashionable and apart from others overseas, in Britain there was one built at Newport over the River Usk and another at Middlesbrough over the River Tees. Higher up the river at Bank Quay in Warrington this also seemed the ideal solution to connect two parts of an expanding company that had sites on either side of the Mersey. Joseph Crosfield & Sons was a chemical company that later specialised in manufacturing soap and is probably best known nationally for its washing powder called Persil. So, also in 1905, it built the original Warrington, or Bank Quay, Transporter Bridge across the river at this point, in the same lofty looking style as the Widnes to Runcorn one. Costing about £4000, it was originally built to service a cement manufacturing plant and also carried a pipeline. As the company expanded it also maintained a busy ferry for employees at Bank Quay. It is difficult to establish when this first transporter bridge was demolished but I certainly photographed it in October 1962. There is no doubt that it was a success, for when Crosfields expanded and modernised it planned another such bridge. 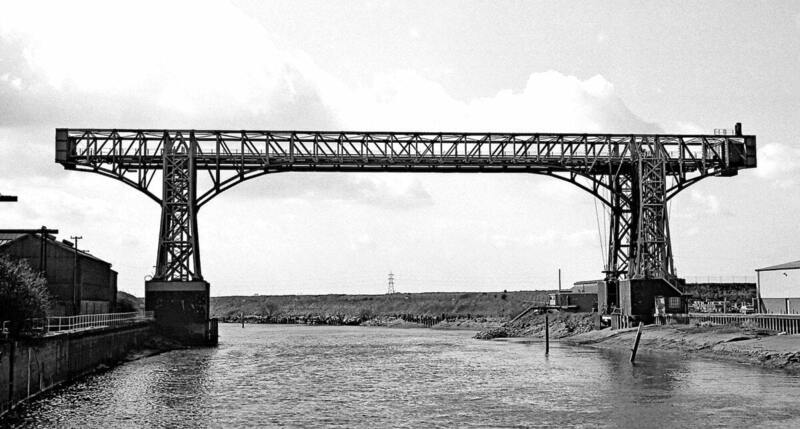 The second and existing 1915-built Warrington Transporter Bridge in 1978 – after it finished operating about 1964 – which the Friends of Warrington Transporter Bridge are campaigning to preserve. The second and existing Warrington Transporter Bridge was built during the First World War in 1915. It was designed by William Henry Hunter and built by William Arrol and Co and is of a simpler concept than the original. It has a span of 200ft (61m), an overall length of 339ft (103m) and a height of 76ft (23m) above high water level. At 30ft (9m) wide, it was originally designed to carry railway wagons up to 18 tonnes in weight, and was converted to carry road vehicles in 1940. In 1953 it was altered to carry loads of up to 30 tonnes. It is interesting to note that from 1915 to the 1960s the River Mersey had no less than three of the world’s few transporter bridges. Warrington Transporter Bridge was disused by about 1964 but has been designated as a Grade II* listed building and is protected as a Scheduled Ancient Monument; but because of its poor condition it is on the Heritage at Risk Register. 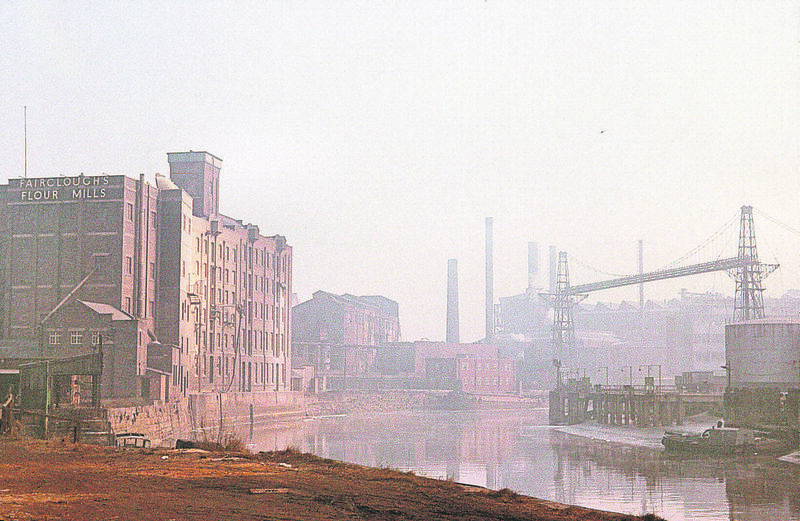 My personal connection is that one branch of my family, trading in Mersey Sailing Flats and barges, worked from Bank Quay and lived close by but also my father and many relations and friends worked for Joseph Crosfield & Sons and its successors. A local group called Friends of Warrington Transporter Bridge (FoWTB) was formed in April 2015 which – as an independent voluntary organisation – campaigns to safeguard the future of the bridge and its industrial heritage status. It is working with other organisations and Warrington Borough Council (WBC). At a first very useful meeting FoWTB was given copies of a lease and engineer’s report on the bridge from 2000; also a set of engineer’s drawings of the bridge. WBC funding issues preclude any progress before the start of the next financial year in April 2016 but then a new engineer’s report will be commissioned. 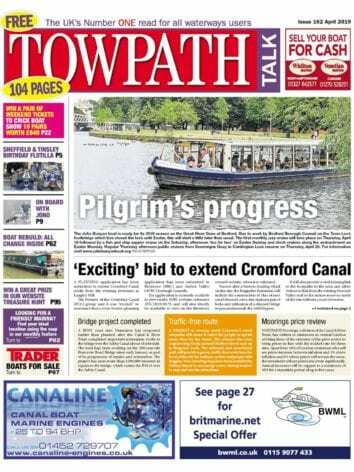 Work will continue on the footpath access and a ramp giving pedestrian access to the Mersey and the bridge. It will be a significant landmark in the first phase of a Warrington Waterfront Development and new signing and interpretation boards are being considered.